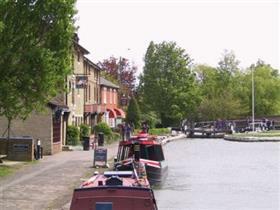 Stoke Bruerne is a picturesque village, dominated by the Grand Union Canal which runs through it. You can walk or cycle alongside the Grand Union Canal, perhaps before getting an ice cream from the cafe. Or just come and sit by the canal and watch the boats tackle the lock and take in a drink or meal at one of the cafes or pubs. Housed in a restored cornmill in Stoke Bruerne, the museum collection documents 200 years of inland waterways. This form of transport was key to the industrial revolution in Britain. The "living canal" outside has a flight of locks, boats and the Blisworth Tunnel.